Yesterday I walked around the hill fort on CatBa Island where Ho Chi Min visited. In fact as I write the anniversary of that visit is being celebrated in the street outside my hotel window by the population of the island. There are at least forty tents aligned side by side each playing a different genre of music as loud as possible overlayed by the national anthem on a regular basis. Currently the karaoke tent is well ahead of its rivals in the ‘who can burst as many ear drums as possible’ competition. The walk up to the fort was amazing. Peaceful with stunning views of the bays. Best of all my partner and I were the only tourists up there. As we walked up to the summit we passed several signs that advised us that it “was definitely dangerous” and “maybe dangerous”. Unfortunately, what harm could befall us was not made clear. We looked up, down, over the scrub at the side of the road, checked the road for enormous boulders rolling down the hill – nothing. 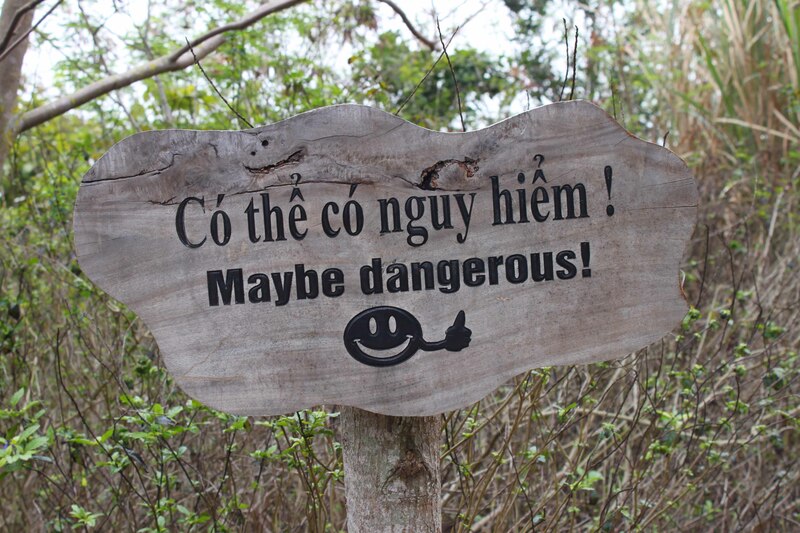 The last sign varied its advice and said “see possibly dangerous animals”. The writing ended with a smiley face giving the reader the thumbs up. All a bit too casual for my liking. First, anything with fangs, horns, sharp teeth, venom or a nasty temperament is quite definitely dangerous and to be given a wide berth. Second, what kind of idiot on rounding a corner would be happy to come face to face with an animal that can gore, bite or kill. Well gung-ho TV personalities of the Steve Erwin ilk would. But most sane people would back away whimpering quietly or leg it as fast as possible depending upon which dealing with deadly animals literature they had recently read. Third, what makes an animal possibly dangerous? Maybe it has had a bad day and decides to take a chunk out of a passing tourist. Maybe it’s just very chilled and just can’t be bothered to sink its fangs into flesh. Maybe it has developed a conscious and only kills deserving victims. It’s all a bit too ambiguous for me. I proceeded nervously jumping at every rustle in the undergrowth. Fortunately, no encounters of the possibly dangerous kind occurred. Unlike the time in Thailand when I nearly ended up as lunch. I am not a great swimmer and wear a life jacket when I snorkel. So there I was happily splashing around, looking at the pretty fish and drifting away from the crowd when I looked down and saw two wide smiling toothy jaws with sleek grey bodies heading up towards me. I panicked and swam/floundered/floated back to the boat expecting to feel excruciating pain at any minute. Reaching the boat in safety I flopped on the boards and gasped out “shark”. The captain seemed very amused. “You very lucky” he said. “Lucky to be alive?” I asked. “Shark just being curious” he replied. “Curious to see what their lunch would taste like!’ I retorted. He smiled. Sadly sarcasm is lost on some people.